This stopped me in my tracks. Flowering for the first time near the top a tree in the Tropical High Elevation House was an orchid I'd not noticed before. 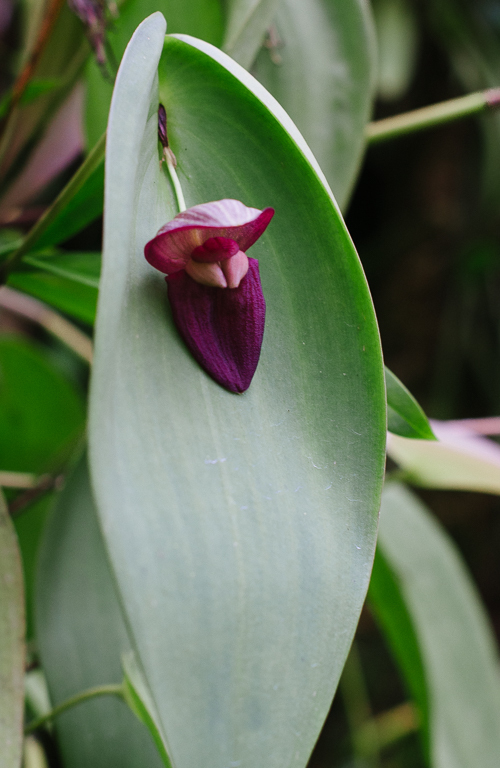 With its big solitary flower, it looked almost like an adolescent Pleurothallis gargantua. But the feeling that something was amiss sent me scurrying to the back up greenhouse for a ladder and then a closer look. 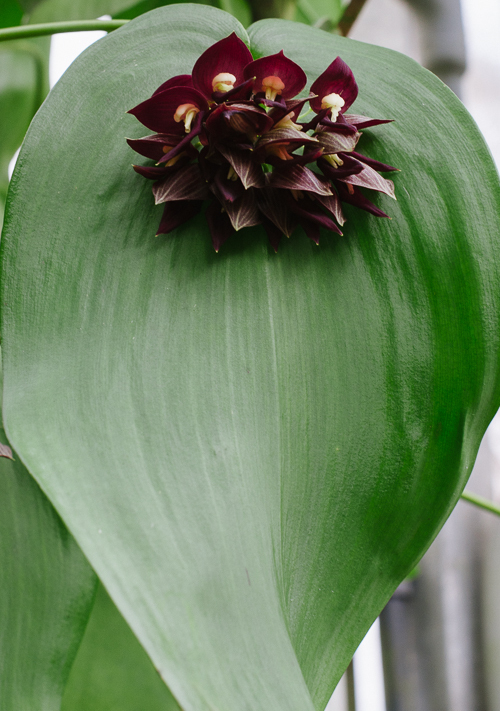 The handwritten label from Ecuagenera Nursery read 'Pleurothallis teaugei + gargantua.' Odd. What did the plus sign mean? If Ecuagenera had created a hybrid, wouldn't they have labeled it with the names of the parents, separated by an 'x'? Is this plant a hybrid? Are teaguei and gargantua the parents? 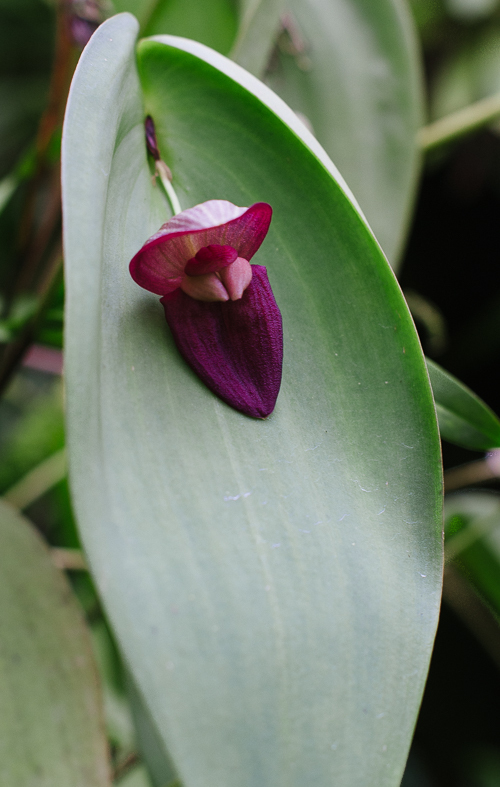 Here's Pleurothallis gargantua, with its enormous solitary flower. For a quick guide to the floral parts, go here. 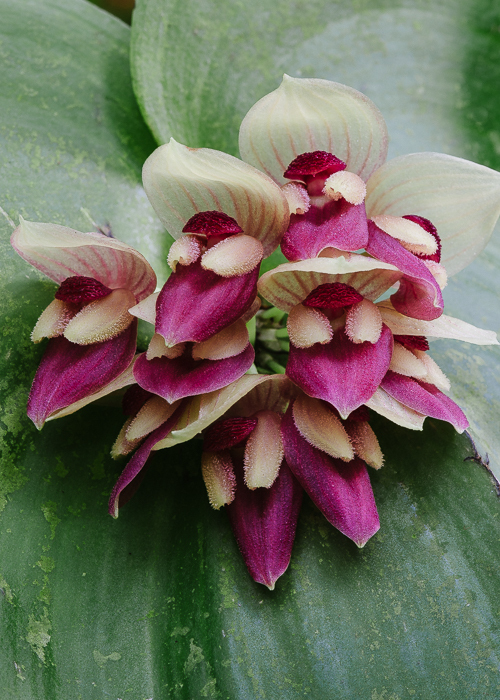 The sepals look very much like those of our unknown orchid. But note that gargantua's rosy petals and yellow lip are very different. And here's Pleurothallis teaguei flowering in the Tropical High Elevation House. If our unknown orchid is a hybrid, it could have inherited the rolled white petals from a teaguei. But where is it getting its rosy lip? Most likely not from gargantua or teaguei. Flowering simultaneously was Pleurothallis marthae. 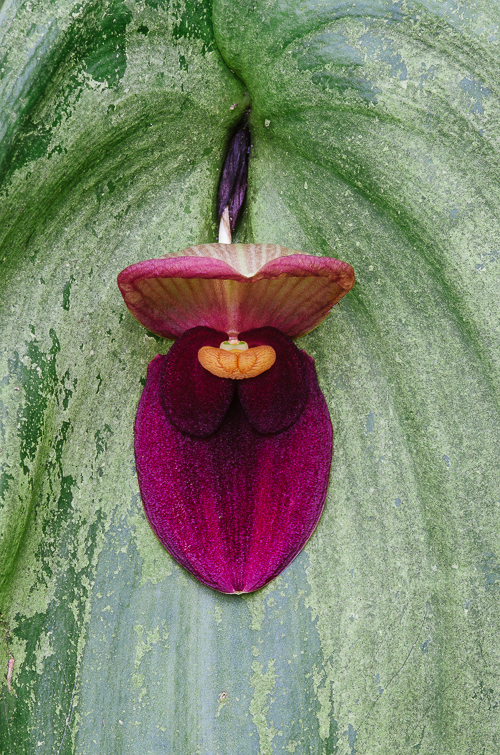 With its rolled white petals and rosy lip, it appears to be a more likely contributor to the unknown orchid's genome. But I can't be sure. The first step toward putting a name on this plant is to email a picture to Ecuagenera Nursery and ask for their data. Pleurothallid hybridization isn't exactly trending among commercial orchid growers, but I wouldn't be shocked if it were a hybrid. The larger Pleurothallids are fairly easy to pollinate. Alternatively, could this be a plant that Ecuagenera collected not in flower, and perhaps the names on the label were meant to be speculative? Could it be a species? There is nothing like it in Icones Pleurothallidinarum. Whatever it is, our mystery Pleurothallis is a handsome plant. You can see it flowering now on the tree next to the door to the Conservation greenhouse. I've been puzzled by that flower myself! :-) I believe they did offer a gargantua x teaguei at one point. It's not on their site anymore, but they have a couple other teaguei crosses. One is is crossed with dilemma, which sounds very interesting. I'm just glad to know I wasn't the only one confused by this flower. Thank you for the splendid blog and photos! teaguei and dilemma! Go crazy, Ecuagenera! Can't blame them, though. It's hard to resist the impulse to slap the teaguei pollinia on another species.